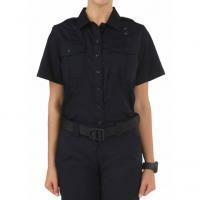 The Women's PDU S/S Taclite Class-A Shirt from 5.11 Tactical is designed for a comfortable, professional appearance that looks as good at the end of the day as it did at the beginning. Its wear-resistant, Taclite® polyester/cotton blend ripstop fabric resists shrinking, fading and wrinkling. An added Teflon coating prevents stains and grime. The design includes bi-swing shoulders to preserve a full range of motion, especially important for firearm use, and features stitched eyelets under the arms for increased ventilation. The chest pockets provide a convenient storage space for smaller accessories and have hook-and-loop flap closures with pencil pockets for additional security. Welt openings along the side seams provide access for microphone cords, offering compatibility with communications equipment.